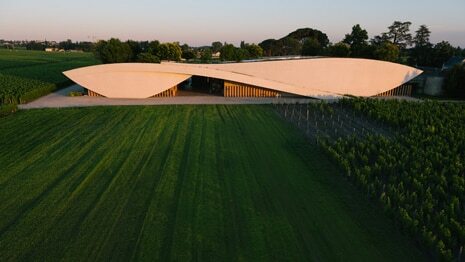 Designed by Christian de Portzamparc and inaugurated in June 2011, the cellar features two enormous waves of white concrete that rise magnificently out of the ground. There is a garden of wild grasses atop this artificial hill, whose gracious curves are overlooked by the château. The wine cellar lets in natural light and has a pure, simple design that seems out of time. It is entirely suited to Cheval Blanc. 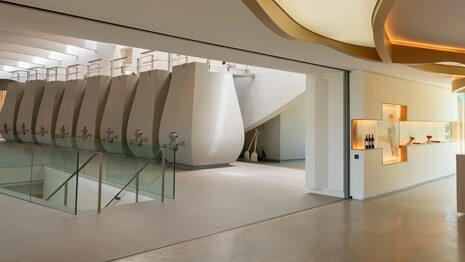 Natural light penetrates into the vat room, with its fifty-two vats in six rows. Built in Italy, these concrete vats come in nine different sizes, from 20 to 110 hectolitres. Each one is devoted to grapes from a different plot and displays two plaques: one permanent one with the number and the capacity of the vat, as well as another removable one showing the plot number, the grape variety, when the vines were planted, and when the grapes were put into vat. 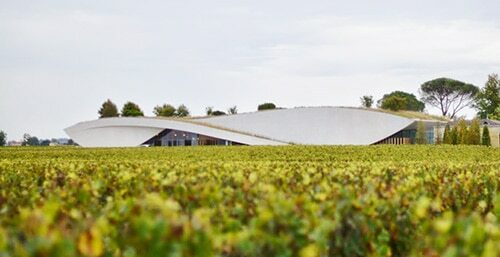 This “tailor-made” winemaking means that vats correspond exactly to individual vineyard plots, and is conducive to fine-tuning the final blend of wines from Cheval Blanc’s homogeneous terroir. The cellar is fully in keeping with the château’s extreme attention to detail throughout the winemaking process. In fact, the Cheval Blanc cellar was the first in its category to be certified for the High Quality Environmental (HQE) standard. Known for its stringent criteria, this certification recognises the care taken in choosing building materials, energy saving, waste water management, and the sorting of solid waste, as well as acoustic comfort and employee well-being. On the 20th of November 2013, the Cheval Blanc cellar received the famous International Architecture Award from the Chicago Athenaeum, a museum of architecture and design. The cellar also received an award from the Centre européen pour le Design d’Art architectural et d’Etudes urbaines. 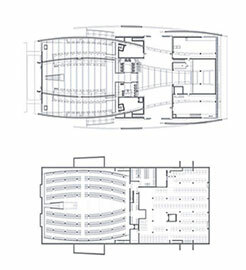 The latter recognises distinctive, avant-garde, innovative buildings. Cheval Blanc was the first wine cellar ever to receive this honour.